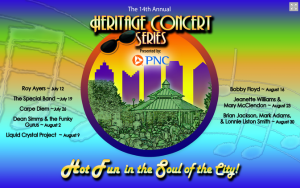 The Heritage Concert Series is the hottest summer concert series in town, featuring stellar entertainment with live performances by top national, regional and local artists. This year’s line up includes: Roy Ayers 7/12, The Special Band 7/19, Carpe Diem 7/26 Dean Simms 8/2, Liquid Crystal Band 8/9, Bobby Floyd 8/16, Jeanette Williams & Mary McClendon 8/23, and Brian Jackson, Mark Adams, & Lonnie Liston Smith 8/30. Roy Ayers is an American funk, soul, and jazz composer and vibraphone player. Ayers helped pioneer jazz-funk often called; “Godfather of acid jazz” may be best known for his songs “Everybody Loves the Sunshine”, “Evolution”, and “Running Away”. Lonnie Liston Smith, Jr. is an American jazz, soul, and funk musician who played with important jazz artists such as Pharaoh Sanders and Miles Davis. His recordings are widely regarded as classics in the fusion, quiet storm, smooth jazz and acid jazz genres. New this year, attendees will experience a variety of food and merchandise vendors, and more. Reserved tables on the patio will also be available. In case of inclement weather, check our website, Facebook, or listen to Magic 106.3 FM WXMG for venue change or cancellation announcements. “We continue to celebrate our 25th Anniversary along with 200 Columbus, and invite everyone to join us Thursdays in July and August for an evening of great food, fun, and the best in live entertainment. We’re looking forward to seeing everyone beginning July 12th and throughout the summer”, comments Interim Executive Director, Demetries Neely. New this year, is a free shuttle service to and from East High (Broad) and Trinity Baptist. The Heritage Concert Series is sponsored this year by Value City, Safe Auto, Budweiser, and Pepsi! For more information, call The King Arts Complex at 614-645-KING (5464) or visit www.thekingartscomplex.com.